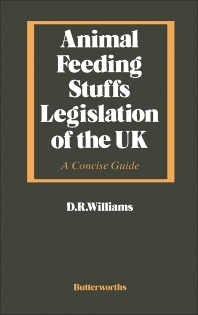 Animal Feeding Stuffs Legislation of the UK: A Concise Guide offers a guide to legislation governing the production, sale, and distribution of animal feeding stuffs in the UK. Individual statutory instruments are discussed and categorized according to their relevance to raw materials, straight feeding stuffs, compound feeds, medicated feeds, and additives. Sampling, the rights of inspectors under different acts and regulations, codes of practice, and labeling requirements are also considered. This guide is comprised of nine chapters and begins with an overview of UK laws governing the manufacture and supply of animal feeding stuffs, including Agriculture Act 1970 Part IV, Medicines Act 1968 and Regulations made under it, and Animal Health and Welfare Act 1984. The next chapter presents a definition of terms, including those applied to animals with respect to the UK feed regulations. The reader is then introduced to statutory statements for raw material or straight feeding stuff; compound feeding stuffs; and additives and premixtures. This book also considers the registration system for manufacturers and qualifying on-farm mixers, along with licensing requirements for products to be used in feeds. The final chapter is devoted to statutory requirements for sampling and analysis of animal feeding stuffs. This monograph will be a helpful and authoritative resource for feed manufacturers, raw materials suppliers, technical advisors, enforcement agencies, and students of feed and livestock production. Dr David R. Williams is Associate Professor of Health Care Management in the College of Health Sciences at Appalachian State University. He received his PhD in Administration Health Services from the University of Alabama at Birmingham. A former senior executive for both non-profit and for-profit healthcare entities, he is a Fellow in the American College of Healthcare Executives. He has presented and published widely on management, governance, and financing issues facing healthcare entrepreneurial firms, with a focus on biopharmaceutical IPOs.